2019 is shaping up to be a year to remember in NAMM-land! Our intrepid staff members who made the jaunt to Anaheim are currently squirming with excitement over these latest announcements! With new products unveiling themselves thick and fast, we thought it might be useful to round up a few of our favourite announcements. This is what is getting us hot under the collar as of today, however: NAMM is far from over so keep a tab open for the guitarguitar website: we’ll be adding new gear and articles as they are announced! 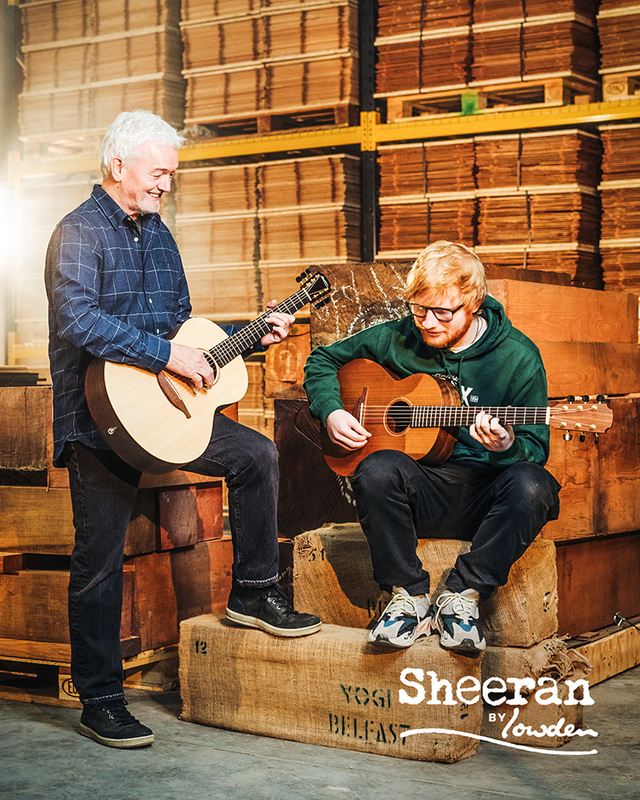 Sheeran by Lowden, as this range is called, are all smaller sized guitars, as per Sheeran’s lifelong preference. There are two main body types, the ‘S’ and the ‘W’, which differ slightly in body length and depth. The models all feature solid tops (either Spruce or Cedar), layered bodies of Walnut or Santos Rosewood and Ebony fingerboards. Many of the models are fitted with quality LR Baggs Elements VTC pickup systems and all come with gig bags. 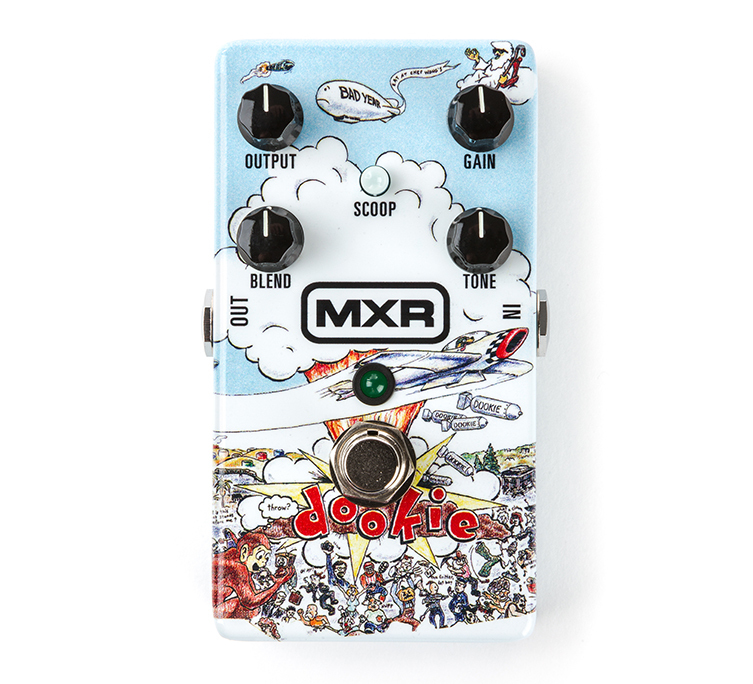 Our childhood selves are throwing fists into the air with Glee as MXR announce the brilliantly out-of-the-blue Dookie distortion pedal. There is no denying that Green Day’s Billie Joe Armstrong has always had a delicious tone, and this new pedal promises to deliver just that in a compact pedal. The MXR Dookie Drive has two blendable signals (based on his Dookie-era two-amp setup) to get the right amount of brutality and warmth. A ‘scoop’ switch helps bring the heavy. This pedal comes with custom graphics that all Green Day fans will instantly adore. We cannot wait to plug this in and indulge in a power chord frenzy! 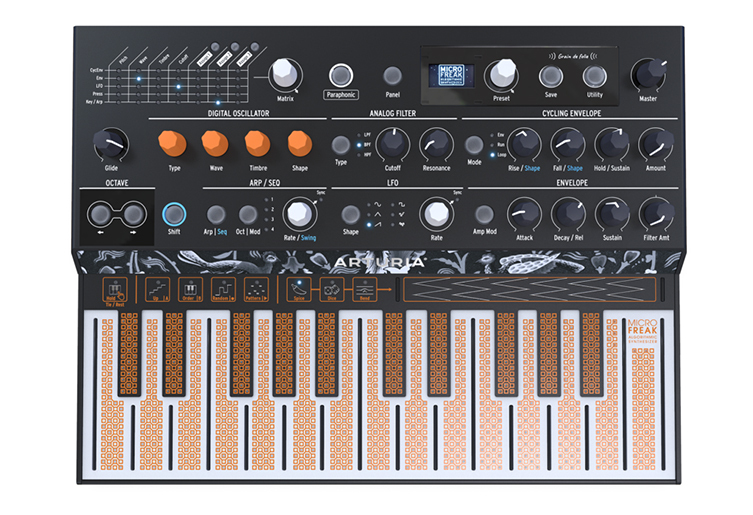 French synth maestros Arturia have announced a very interesting synth in the shape of the Micro Freak. In a market full of small synths, this genuinely offers something fresh and fun. Arturia have opted for a hybrid design here, coupling a digital oscillator with an analog filter section. Not only that, some of the oscillator modes have been designed in collaboration with Mutable Instruments, something that will most definitely prick up the ears of modular fans. The keyboard itself is a real point of interest: it has no moving parts! Yes, the Arturia Micro Freak uses PCB technology to bring an innovative keyboard that offers pressure sensitivity and polyphonic aftertouch, something that is not readily available on similarly priced synths. We are pretty excited about seeing what this little Freak can do, given its interesting design and prestigious provenance. Bring it! Back to acoustics now and Fender surprise us all by resurrecting their hybrid Acoustasonic as a new USA-made range of instruments. Clearly, there is a place in the market for a gig-able, quality acoustic guitar hybrid that behaves well with electronics and offers a distinctly unique playing experience. Initial reports and teaser videos are revealing some exceptional sounds and a pleasing, cross-genre versatility that should prove this guitar’s trump card. 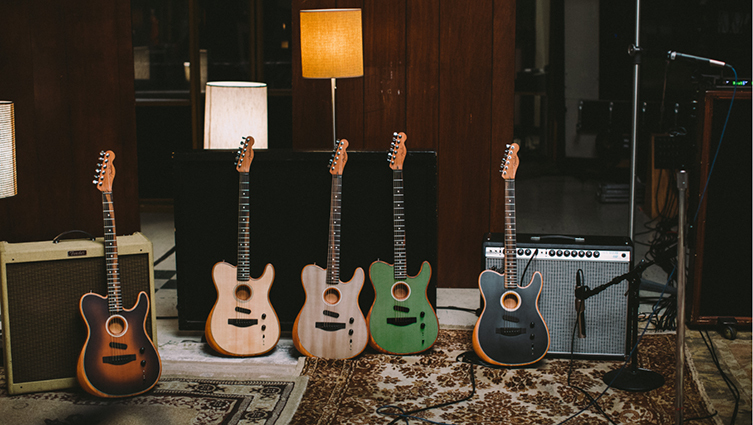 The Fender Acoustasonic has no less than three pickups: a Fishman undersaddle piezo, a Fishman Acoustasonic Enhancer and a surface-mounted Fender Acoustasonic Noiseless magnetic pickup. Fishman have been highly involved with this guitar: onboard is an Acoustic Engine, designed by them and featuring ten blendable body style & tonewood combinations for some discrete modelling technology. We’re eagerly awaiting these landing in stores! Fender’s other big reveal at this year’s Winter NAMM has been tied in with Led Zeppelin’s 50th Anniversary. 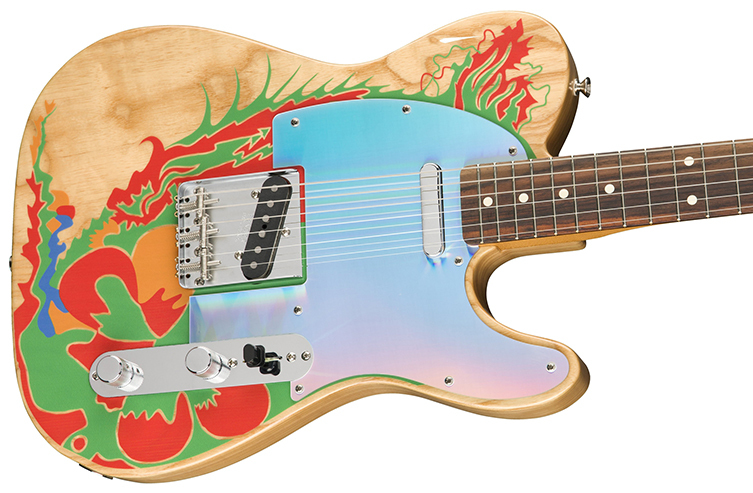 Jimmy Page has worked closely with Fender USA, Mexico AND the Custom Shop to offer four variants on his famously mysterious Dragon Telecaster. Depending on the model you choose, you can have this magical guitar pre-or-post decoration (the original started life as a 1959 Blonde Tele before Page ‘went for it’ with the paints). Fender Mexico are offering the full-on Dragon look whilst the US version is White Blonde and comes with 8 round mirrors to attach according to taste. Both feature custom-wound pickups and come with some exciting case-candy. The Custom shop models have hand signed headstocks and (on the Dragon model) artwork partly carried out by the Led Zep maestro himself. See our dedicated article for more info on these! Our final NAMM pick for now takes us back to the land of acoustic guitars. Taylor have just released an entire new body shape! Dubbed the Grand Pacific, this new shape aims to improve on no less a design than the immortal Dreadnought! 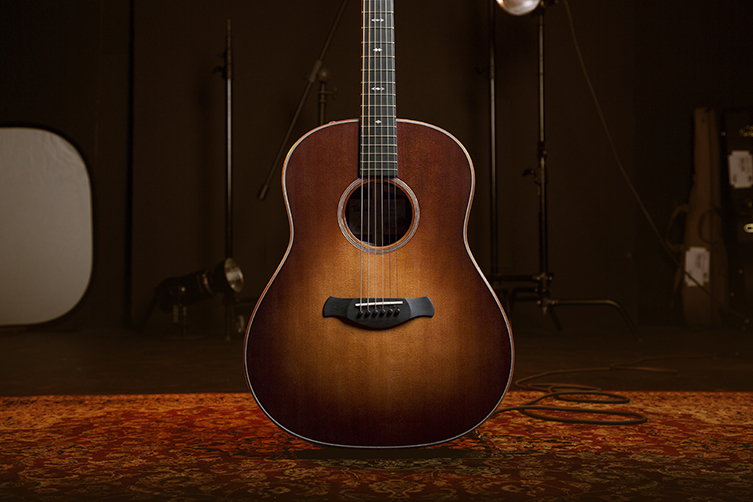 Taylor’s main man Andy Powers has been let loose on this mission: he brings his V-Class bracing along to a dreadnought-inspired design that rectifies some of the perceived tonal limitations of this age-old shape. Taylor are including Builder’s Editons with this new ‘17’ range. This means torrefied tops, rolled fretboard edges and chamfered body edges for luxury and comfort. These look like they’ll be an exciting addition to Taylor’s comprehensive range of quality acoustics. That rounds off our first selection of NAMM top picks! Remember to check back in as we hear more from California!